Sunday, March 14 2010 - 2010 Canadian Mountain Running Championships Registration Open! Amy Golumbia, from Calgary, AB, is the reigning Canadian Mountain Running champion, and two-time World Mountain Running Championship competitor. Syl Corbett, from Calgary, AB, is a 4-time member of the Canadian Mountain Running team. Her best performance at the World Championships was 41st in 2003. Emily Solsberg, from Duncan, BC, competed for Canada at both the 2008 and 2009 World Mountain Running Championships. Kris Swanson from Tumbler Ridge, BC, was third at last year's uphill only Commonwealth Mountain Running Championships. 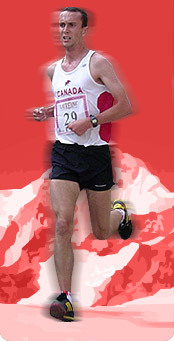 Adrian Lambert from Edmonton, AB, is a three-time national mountain running team member. He finished 21st at the World Championships in 2007. Jason Louttit from Squamish, BC, has represented Canada internationally on numerous occasions. His best result was a 32nd place finish at the World Championships in 2005.